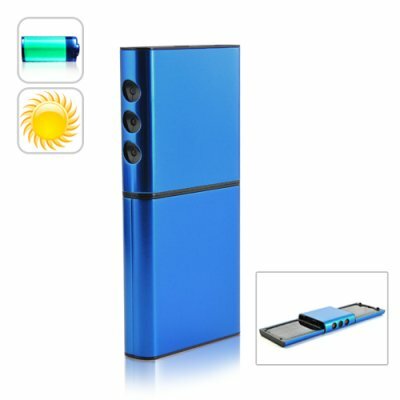 Successfully Added Solar Charger and Battery with Dual Charging Panels to your Shopping Cart. Solar Charger and Battery - the ideal green tech gadget for charging your mobile phone and USB-powered devices at any time and any place. Features Dual Solar Charging Panels for even faster charging on-the-go. Enjoy many extra hours of extended usage on your mobile phone or USB-powered devices with this Solar Charger and Battery. Charge it up through USB and then carry it around as an emergency power supply that is ready at a moment's notice. When the battery itself is low, just use the dual charging solar panels and watch it go back to full again in a few hours. For the easiest way to charge your mobile phone or USB-powered device on-the-go, check out this Solar Charger and Battery. Available in our warehouse now, order today and we'll express ship it out tomorrow. Brought to you by the leader in wholesale electronics - Chinavasion.